For 2016, Nuit Blanche lost Scotiabank as its title sponsor. In the weeks leading up to the all-night event, many started questioning what it be like this year. While it was a bit smaller than usual -- there were 90 exhibits as opposed to 110 in 2015 -- the crowds were just as robust as in years past, and there was genuine awe over the spectacle at City Hall. The sheer number of video installations got a little repetitive after a while, but there were many positives to take away from this year's event, not the least of which was that Nuit Blanche seemed as vibrant as it celebrated its 11th year. Here are our highlights and lowlights from Nuit Blanche 2016. Sure, this might seem like a dubious point to put under the best category, but I think many of us were expecting a cold and rainy night. Luckily, the weather held up (for the most part) and it wasn't as cool out as previous years. Usually, Nathan Phillips Square is a nightmare during Nuit Blanche. This year, however, it was the place to be. Despite some graffiti on the Toronto sign, Director X's Death of the Sun popped up all over Instagram, but Floria Sigismondi's Pneuma (which animated the square's reflect pool) was the real star of the show. 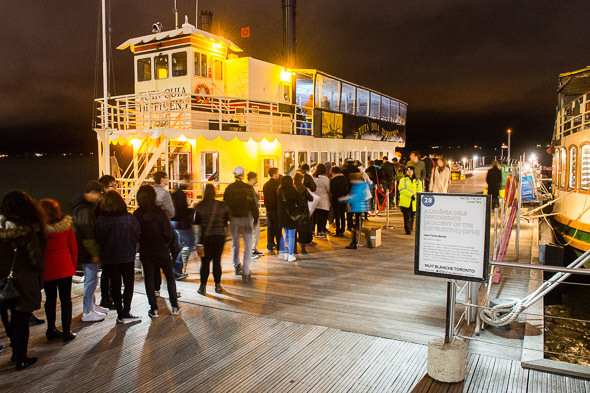 The Harbourfront might have been the least crowded part of the city (at least at some points last night). Thanks to the fog, it seemed especially dreamy down by the lake, especially since many of the installations focused on water and the sky. Nuit Blanche really needs to embrace more of the city if it hopes to stay relevant for the long haul. A good start was programming at the Aga Khan this year. The Sparks exhibit looked gorgeous beside the stunning architecture of the building, and the interest in the cluster of installations bodes well for those who think Scarborough could play host to an exhibit hub next year. 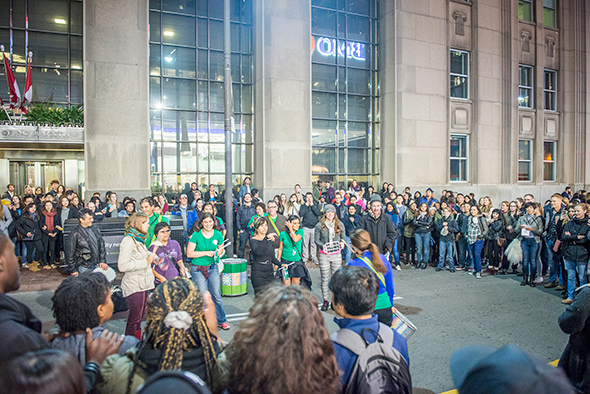 Nothing livened the streets more than the roaming dance parties and drum circles that randomly formed on downtown streets thanks to unofficial Nuit Blanche programming. It seemed this groups were given more freedom this year. A few individual exhibits are worth some extra attention in the "best" category. Kevin Cooley's tower of televisions screens in Brookfield Place somehow did totally manage to convey the power of water pouring over the Niagara Escarpment right down to the thunderous noise. 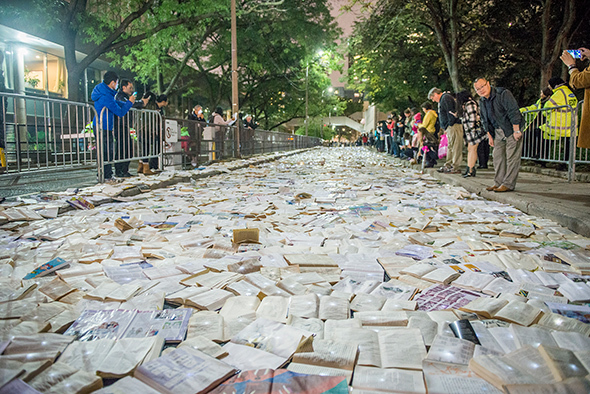 What better way to described this than as a river of illuminated books? Some Nuit Blanche exhibits that use the street as a canvas fall short because they eliminate an interactive element, but the scale of Luzinterruptus's installation was so grand that everyone just looked on in awe. With all the partying and fooling around that defines Nuit Blanche, it was arresting to see this installation at St. Joseph's College School, which used 139 talking sticks to represent the history of Residential Schools in Canada. This was a calm that surround this exhibit absents elsewhere in the city. Usually, I'm a big fan of car-free streets. However, Queen Street West was closed down, yet didn't really feature much art. From about University to Spadina, it was packed with drunken crowds wandering aimlessly about. There were moments of excitement, but it would have been better with installations running along the entire stretch. Nathan Phillips Square was a remarkable place during Nuit Blanche, but the goofs that decided to write inane messages on the Toronto sign brought the good vibes down a notch with their lack of respect. Stuff like this gives Nuit Blanche a bad name. Pockets of boredom along John St. This was, perhaps, an uneven Nuit Blanche. While there were intriguing exhibits across the city, pockets of somewhat predictable video installation on King West and the Entertainment District didn't hold up against the excitement at City Hall and the Financial District. Is this really an all night event? As has happened in year's past, Nuit Blanche doesn't tend to live quite up to its name. As of 4 a.m., the art-watching crowds had been replaced with people chowing down on street eats and heading home (anyone else notice how many conventional cabs were available?). It would be cool if more people made the push to see exhibits past the hour that the bars let out. 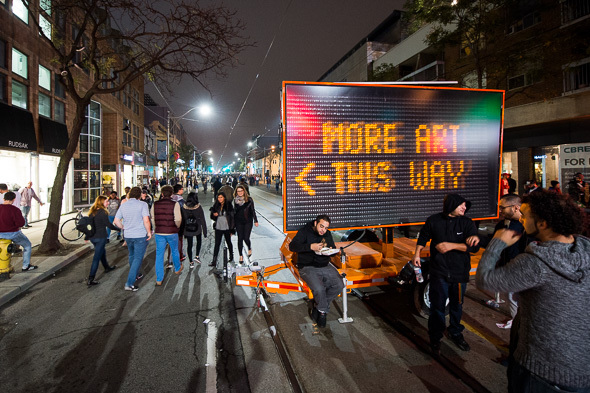 What were your highlights and lowlights from Nuit Blanche this year? Let us know in the comments. Writing by Amy Grief and Derek Flack / Photos by Matt Forsythe and Hector Vasquez.